Welcome to Camp Central at All Heart! Click here for a brief overview of All Heart's Camp Program! Discount Program Expanded! Click here for a complete listing of All Heart's Camp Discount Program! Our Camp Program is in its 16th year!! All Heart Horse Farm is an equine facility located twenty minutes south of the Houston Medical Center. Our approximately twenty-five acre farm is four miles east of Highway 288 on Highway 6, in a beautiful rural setting surrounded by woods. Our facilities were constructed in 2004, including an 80' by 200' covered dressage arena and a 125' by 210' outdoor jumping arena. 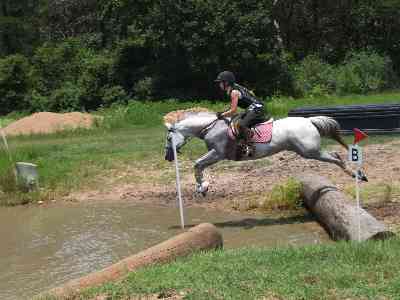 We offer Riding Lessons and Training in dressage, hunter/jumper and eventing. All Heart Horse Farm excels at teaching students at all experience levels, and we have competitive, top-quality training in a relaxed and friendly atmosphere which emphasizes a sympathetic attitude toward the horse. Our lesson and training staff includes Heidi Ziemer, Johelen McCandless, and Sherry Bowman. Our program also includes Houston Dressage Society recognized schooling shows with judges such as Pam Fowler Grace, Julie Berry, and Leslie Cummings. Heidi Ziemer and All Heart Horse Farm are proud to have hosted the Rice University Student Club Equestrian Team in Dressage and Hunter/Jumper for many years while she was on appointment to the Rice University Faculty. Boarding facilities feature 12'x14' and 12'x12' box stalls and 8'x12' pony stalls. Blanketing, fan electricity, stall cleaning, and turnout are included in full board. Please visit our photo gallery for a detailed look at our facilities!